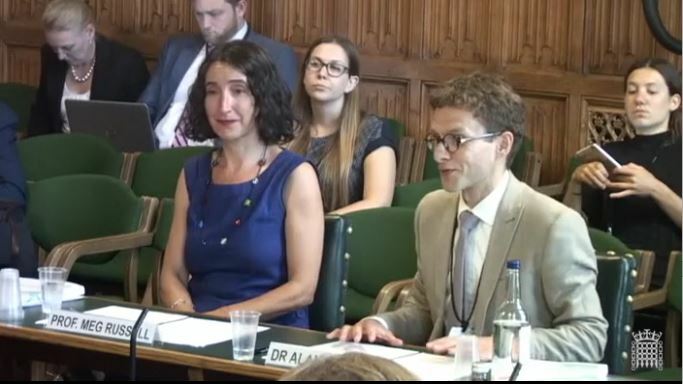 On 24 July, Constitution Unit Director Professor Meg Russell and Deputy Director Dr Alan Renwick gave evidence to the House of Commons Public Administration and Constitutional Affairs Committee (PACAC) on behalf of the Independent Commission on Referendums in a one-off evidence session on the Commission's final report. You can watch the session here; and some key points are summarised below. The place of referendums in UK democracy has not been firmly established. The use of referendums has historically been driven by political pragmatism, but some constitutional principles have emerged from this. Referendums should not be used as 'quick fix' solutions to solve political disagreements, they must be embedded in wider processes of decision making. Holding referendums pre-legislatively increases the risk that the proposals for change will be unclear. This can put parliamentarians in a difficult position when they are required to interpret and implement a result. Wherever possible referendums should therefore be held post-legislatively. If this is not possible then the government should be required to produce a White Paper setting out a detailed blueprint for what would happen in the event of a vote for change. The initial provisions for a pre-legislative referendum should allow parliament to trigger a second referendum if the change delivered differs significantly from these proposals. The Commission takes no view on whether there should be a further referendum on Brexit. The Commission does not recommend extending the use of referendums to moral issues, as this may be damaging to those whose rights are at stake. The UK has a strong tradition of un-whipped parliamentary votes on such issues, which could be supplemented by citizens' assemblies, as an alternative way of engaging the public in important decisions. Proper preparation should take place before a referendum, including development of the options voters will be asked to choose between. This could again involve input from citizens' assemblies, to supplement, rather than replace, existing representative institutions. The Commission makes a range of recommendations to improve the accountability of campaigners, including reducing the time in which large campaigners are required to submit their audited accounts from six to three months. It also recommends extending the section 125 'purdah' period and narrowing its scope to target campaigning activity. holding a parliamentary inquiry into paid political advertising across all media. The legislative changes recommended by the report should be introduced by the government before the next referendum so that they may be discussed on the basis of their own merit, and not become part of debate on a specific referendum. More information on the Independent Commission on referendums including the full report and executive summary can be found on its webpage.